Do you ever an idea in your head that keeps you up at night? For me, it was this scarf idea. I had donated a hat to my a fundraiser my cousin was hosting. It was the Peek-a-boo plaid hat from Ravelry. Check it out here if you are a crocheter or a plaid lover. Apparently the hat did well as a silent auction prize and people were asking if I sold them and if there was a scarf to match. I have never designed a scarf before. I had only ever designed a crib sized baby blanket, (check it out here) and although that is larger, this seemed more daunting. However, the idea that someone or perhaps more than one someone, had asked about a scarf made me think it would be a good seller at one of our craft shows. So I’m wide awake, laying in my bed, while on a family vacation at the Great Wolf Lodge, trying to figure out how to make this scarf happen. The next evening when the two members of the fourth generation had finally wore themselves out from the waterpark, I searched the hotel room for a piece of paper and a pen. What I found was an envelop, that I carefully opened up and wrote on the inside. I attempted to plan out the rows of the scarf without having much to work with for yarn and materials. You can see my envelop planning here in the first picture I took of the scarf in progress for Instagram. Although the initial math had me frustrated, I am very happy with now the scarf turned out. My sister had to put up with a lot of “do you think this looks okay?” questions during this process. Trying to get the perfect balance between grey and plaid was tricky. I had something slightly different envisioned before I started stitching, but I think it will work better in a cowl not an infinity scarf. Stayed tuned for another plaid design soon. In the meantime, I will walk you through this scarf pattern or you can purchase an ad free PDF version here on Etsy or here on Ravelry. One size. To adjust, add or subtract stitches in multiples of 6. This infinity scarf is worked in the round. Sl st the end of each row to the beginning stitch of that row. Ch 2 and begin next row. Ch2 does not count as a stitch. If you prefer, you can chain 252 and then dc across, instead of fdc 252 stitches. Row 1 – Fdc 252 sts. On stitch 252 do a regular dc, not a fdc, as you do not want to create another stitch foundation because this is the last stitch of of the row. Row 14 – Sl st around to create finishing edge. Thank you for checking out our blog and pattern. The love we have felt for our side hustle (also knows as Aunt Karen’s retirement dream) has been amazing this year. Our sales at the markets and shows we attended were beyond our expectations. We have grown our social media presence and have sold items via Facebook and Instagram. In doing so, we have been in touch with people we have not seen or heard from in years. Along with all of this, we teamed up with Leighla’s Love Bags to help provide postage for their care packages. In one of our proudest moments, we published our first pattern for a Hudson’s Bay blanket inspired crib sized blanket. Oh, and we hauled an infant and a 4 year old to the farmers market every Friday all summer! To celebrate our busy year, we have decided to post pictures and information about our best selling products and which patterns were our favourite to create for our customers. We started the year off with a post on Facebook with our Buffalo Plaid Trapper Hats. We received so much love about the hat that we decided to take pictures of a lot of the items we had stitched. This was really the turning point in our social media presence. Thank you to all those people who liked, loved, shared and commented on that original post. You definitely helped get the ball rolling. Third and fourth generations headed to Florida in late January, crocheting along the way! Have you seen this meme online, it was definitely true in our case. A Dodge Caravan with Stow and Go is ideal for the traveling crafter! 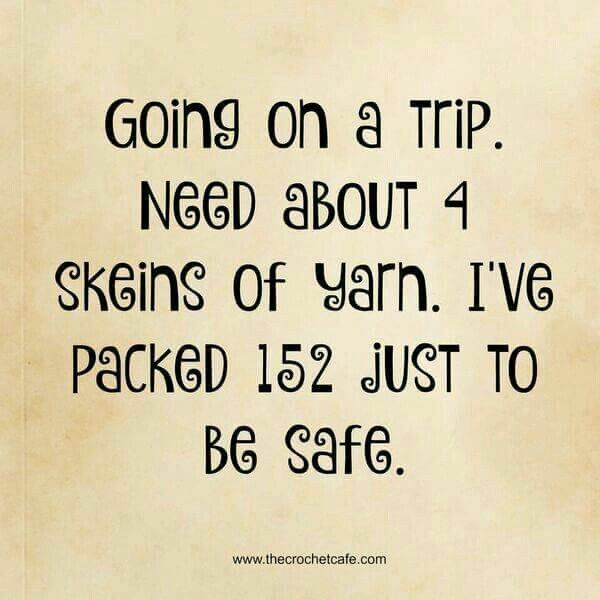 I wish I had taken a picture of the yarn I had stashed in the van. My love affair with the Honey Bird Shawl by Hopefully Honey started on the way back from Florida. This shawl worked up quickly, from Chattanooga to Buffalo, to be exact. Unfortunately, the Kearney Dog Sled Races were cancelled because of poor trail conditions. We missed selling our items and seeing our customers. The love affair continued with the Honey Bird Shawls using Caron Big Cakes. Grandma liked them so much she gave me her (I almost said vintage here, but boy would I get in trouble from Auntie Karen for that) dress form. She used to make clothes for Auntie Karen using this form. I felt very honoured that Grandma thought my work was good enough to deserve being showcased with her dress form. Here is a a picture from our very first photo shoot using the dress form. We are better now at photo shoots, lighting and editing. This was our first attempt. I had been commissioned to create two custom order ponchos. After a lot of searching for the perfect yarn and pattern. The customer and I decided to use Patons Shetland Chunky yarn in Charcoal. I had ordered the yarn a few months before and finally finished up this project in March. When the couple came over to pick them up, the husband was like a kid on Christmas and said it was exactly what he wanted. It was incredibly gratifying to create something that was clearly appreciated. Here is a look at the finished poncho on Grandma’s dress form. The original pattern called the Amelia Poncho by Left in Knots can be found here. A friend of mine asked if we had hats to match our ever popular work sock booties. Since these are knit, I sent the request over to Aunt Karen. She came up with this adorable knit hat in baby sizes. The hat has the white, red and white stripe of a classic wool work sock. I had an order from a returning customer for these baby flip flops from Whistle and Ivy. Click here is her original post. This is the imagine I received from a customer and on the right is the pair I made. In an attempt to use up the remaining Caron Big Cakes yarn I used for the shawls, I started making kerchief scarves. Here are just a few. Posting pictures of the progress of the set of ponchos I made led to an order for another style poncho. This time the customer ordered a cowl neck poncho in cream. We decided on Bernat Premium yarn in Aran and pattern from Ravelry. In April, I attended a bridal shower for one of our favourite people. Our cousin Jamie is the sweetest person. I had talked to her mom about making her a blanket. Jamie loves to travel, especially to warm destinations. I made this blanket using 3 strands of yarn at once, gradually moving from one colour to the next, to the next and to the last and then repeating a few more times. The result is gorgeous, the pain in my hand, arm and shoulder were very real! However, seeing Jamie’s reaction when she realized she was receiving a handmade blanket was well worth it. As an added bonus, we attended a bbq at her house in the summer and the blanket was out on her bed. In April, we attended the Easdale Spring Craft Sale, we were even interviewed by our local paper about our crafting. Aunt Karen’s knit textured hats were very popular. We posted photos of our sale set up and were selling hats even before the sale started. My Grandma’s teddy bears were sent off to their forever home in Holland this month. This month my Dad and I worked on some DIY projects for my house and our craft business. I learned to love chalk paint and spray paint. I was a tad obsessed. I even spray painted my toilet paper holder to change it from chrome to oil rubbed bronze. We made a display unit with removable bars for easy transporting. It involved long discussions in the aisles of Home Depot. I few looks from sales associates who thought I was a dumb teenager (hahaha, I’m 36, so thank you very much) and one funny gentleman, who said, “oh have you been on Pinterest, my wife is always finding things on there.” In any case, the display stand looks great and I’m happy with it. Plus I was able to hang out with my Dad. Aunt Karen mastered the Amish Puzzle Ball. These are great sensory toys of babies. For older children, the toy comes apart into 3 sections which then can be reassembled. Its definitely an interesting way to pass your time. In June, we also had the pleasure of celebrating Grandma’s 90th birthday. We managed to keep it a secret until a few days before. You need to give a girl time to get her hair done! We had a lovely afternoon visiting with family and friends. Grandma even had a chance to visit with someone she babysat over 70 years ago! My sister did an amazing job of planning the decor. She had me spray painting a crazy amount of jars and she worked with a tri-gold and black colour scheme. It was beautiful. Here is a picture of the flower arrangements she made with the jars she had me spray. We were off to our farmers markets and outdoor sales. We are a regular vendor at the Perry Farmers Market in Emsdale . We sold a ton of knit and crocheted animals. Aunt Karen’s fingers were flying trying to keep up. August sees the Kearney Regatta and the Easdale Fall Fair. We always have a great time meeting new customer and seeing friends and returning customers. We published our first pattern this month. I made a crib sized version of Daisy Farm Crafts Hudson’s Bay baby blanket. You can see my blog post here. This blanket went to a childhood friend of my husbands as he and his wife welcomed their first baby in August. We also sent one of my doll furniture sets off to New Jersey. Here is a picture of the Barbie doll sized bedroom set. The Hudson’s Bay inspired baby blanket was very well received. So much in fact that an old friend from high school ordered one for her son and also a unicorn I made using The Friendly Red Fox pattern. October also say the start of hat pattern testing. I ordered many, many patterns from Revelry. I pinned many free patterns to my Pinterest board. I ordered faux fur pompoms after pompoms. Finally settled on a quick pattern by The Friendly Red Fox that has great texture and works from the top down. Its called the Mountain Ridges pattern for anyone who is looking for a great pattern. Craft sale prep mode was in full effect this month. We have been part of the Kearney Christmas Bazaar for years, verging on decades at this point. We sold hat, after hat, after hat. Thank you to all those who bought local! Posting all those hat pictures created a custom order for matching Mom and Baby textured hats with faux fur pompoms. It took a little math on my part to get the baby hat figured out but it turned out great and Mom was so happy. Aunt Karen and I organized an artisans market as part of the Christmas Begins in Kearney event happening on December 1. We had a great turn out with many different vendors and sales were pretty good too! We sold a ton of hats! Plaid is very popular. Especially the Buffalo plaid with its traditional red, burgundy/wine and black colour combo. Its funny, when I was a kid, my sister and I would be so embarrassed to be seen in our dad’s plaid work coat. We used to call them a “Kearney Coat” for the town we live in. Now, I can’t stitch plaid anything fast enough! I even took extra orders for Christmas plaid items. These two Peek a Boo plaid hats were the last order to leave my hooks, almost at the eleventh hour before Christmas! My very favourite order this year was for a set of llamas for a family with four children. The mom sent me a few ideas from Pinterest and we settled on the llama pattern from Grace and Yarn. You can find it here. The pattern is very well written and was fun to make. For this order, we needed two boy llamas and two girl llamas. We decided to make each llamas body with different yarn ranging from off white to a colour called honey. I could not be happier with how they turned out. The best part was that Mom posted a picture to our Facebook page with all four kids holding their llamas on Christmas morning. Reflecting on the year always leaves me starting to plan for the year ahead. Working on our online presence will still be a task for 2019. I plan to do a better job of recording all the things I stitch. I think it would be amazing to look back at in years to come to see what I was up to in my free time. I wish my Grandma has done that over the years. We have a big two day sale coming up in February. Many, many hats will be needed. Thinking about Easter ideas. Planning more plaid of course. My husband is nagging me about a sweater, probably should get on that! Thank you to everyone who has taken the time to read this very long winded year round up. The idea for this blanket started when my husband’s long time friend and his wife announced they were having their first child. I knew I wanted to make something with a classic Canadian feel as we live in the picturesque Muskoka Parry Sound region of Ontario, Canada. I searched Pinterest for something gender neutral, something classic yet modern and something with a Canadian feel. I came across the Hudson’s Bay Baby Blanket by Tiffany at Daisy Farm Crafts. I had already pinned a bunch of their gingham blankets and I have developed a love affair with the plaid stitch after making some items from Bethany at Whistle and Ivy. In Tiffany’s post on the Daisy Farm Craft blog, she shares how her bassinet sized blanket was inspired by an old wool blanket the customers’ parents had for camping. Little did these ladies realize that the Hudson’s Bay blanket is a staple in Canadian history and culture. Tiffany even admits she is slightly embarrassed she did not do more research on the history of the blanket and pattern. I knew instantly that our friends would love this blanket. It’s classic, with a modern feel with the large colour blocks. It has that Muskoka cottage style. Look how lovely the blanket looks draped over a Muskoka chair. For those of you who have never had the pleasure of visiting Muskoka, these wooden chairs are made to slightly recline, making them perfect for relaxing outdoors, preferably at the lake, once the blackflies have gone away. I wanted to make this blanket large enough to fit a crib, rather than a bassinet. So for the first time, I attempted to do the math, using the stitch gauge, to increase the size of the blanket to a standard crib. Also, as lovely as the original Daisy Farm Craft blanket is, the colours were a bit more muted than I recalled. After a lot of late night google image searching and comparing to yarn websites, I was fairly sure I had the right yarn picked out. Living in the north, I have access to a limited number of store selling yarn without driving for over an hour. Luckily, my local Walmart sells Bernat Premium which is a premium worsted weight yarn. It is very soft and the price point is fantastic. Click here to see the Bernat Premium collection available online from Walmart. I posted the progress of this blanket to our Facebook and Instagram and received so much love and positive comments about each step of the project. Its amazing how we as Canadians love all things with that Canadiana flare. For all of those friends and followers who liked, commented and shared my progress, thank you for your support and love. It has inspired me to publish my first pattern in a PDF format and sell it on our Etsy page. This is a huge step for me, as I have only been crocheting for 2 ½ years thanks to the insistence and guidance of my Grandma and my Auntie Karen. To Tiffany and Hannah at Daisy Farm Craft, thank you for your stitch tutorial for the Herringbone Half Double Crochet stitch. I could not have created this beautiful blanket without your assistance. If you need help with this stitch, please use this tutorial. Click here to purchase a PDF of the Hudson’s Bay Inspired Baby Blanket. HHDC in the third chain from the hook. HHDC across in each stitch. (125 HHDC stitches). Turn your work. Ch 2. The blanket is made with 9 blocks of colours. Each block is 125 stitches wide and 16 rows high. To create the border, complete 3 rows of HHDC in Aran, with one HHDC in each stitch and 3 stitches in the corners. You will work 16 stitches on the side of each colour block (1 stitch per row). Do not turn your work after each round. Continue in the same direction for all 3 rows. The border will look different than the stitch in the blanket but this creates a nice, distinct border. Here is the blanket with the border completed. We hope you enjoy this pattern and creating your own Hudson’s Bay Inspired Baby Blanket. Thank you for supporting our family blog. Please tag us, using #3generationcrafters in any photos you post of your finished projects from our pattern. You are welcome to sell blankets made from this pattern. However, you cannot use our photos. Please support our blog by citing 3 Generation Crafters as the designer of this pattern. Whistle and Ivy has the most adorable crocheted baby sandal pattern on their website. Someone tagged us in it on Facebook and since then they have been flying off our hooks. Here is a pair in grey and baby pink. Another in grey with iced aqua. We have many more colour options planned. Keep checking here and our Facebook page to see what we stitch next. Thanks to an inquiry from an old friend, looking for a hat to match our popular work sock booties, we have created a new pattern using the classic white, red and white strip of the traditional wool work sock. Our work sock booties have been one of our best sellers at our summer farmers markets and Christmas sales venues. It seems that everyone knows someone who wears the traditional work sock and has a new baby in their life. We currently offer our work sock booties in three sizes for infants. Now after much discussion and a few attempts, we have a possible contender for a pattern. Look how adorable this little hat is! Keeping checking our website, Facebook page and Etsy shop to see this hat and all our hand stitched products. We have been quiet online both on Facebook and our website and have even set Etsy to vacation mode while we take time to get to know the newest member of the fourth generation of crafters. Please bare with us while we enjoy some quality family time. We will be back in time for the Christmas craft sale and shopping season. As always, please feel free to send us a message if you are interested in any products or a custom order. We would like to thank our family for all their help and support during the summer to help make our dream of this craft business a success. We would also like to thank our wonderful customers who purchased our hand made items at all the local events. Now that the summer Farmer’s Market season is over for 2017, we have our sights set on the local Christmas sales. You will find an updated list of sales we are participating in under Sales Venues. We will be continuing to make our best selling items including our work sock booties, stuffed animals and Disney Princess inspired loveys. We are excited to grow our line of crocheted hats with the Plaid Trapper Hat, which we will have available in sizes ranging from 0-3 months up to adult. Just look how adorable this hat is in a 3-6 month size! Please continue to check in for updates as we approach the holiday shopping season.